Although it resembles and is called a root, ginger is actually a rhizome or underground stem of a tropical plant native to Southeast Asia. 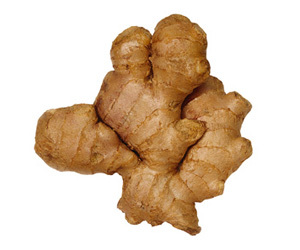 Gnarled and bumpy with tan skin, fresh ginger has slightly fibrous greenish-yellow to ivory flesh, a peppery, slightly sweet flavor and pungent aroma. It’s traditionally used fresh or pickled in Asian cooking and as a dried ground spice in American and European dishes. Crystallized or candied ginger is fresh ginger cooked in sugar syrup and coated with sugar. As a rule, fresh ginger cannot be used interchangeably with dried, pickled or crystallized ginger. Available year-round, fresh ginger complements a wide variety of foods, from savory to sweet. In addition to classic Asian dishes, use it in creamy dips, salads, side dishes, sauces, soups, marinades and with meat, fish and poultry. Fresh ginger is often sold in large pieces called “hands,” which can be broken into smaller pieces for purchase. Select pieces that are firm and heavy with smooth, unbroken skin. Avoid pieces with wrinkled skins as the flesh will be dry and more fibrous. Wrap fresh, unpeeled ginger tightly in plastic wrap and refrigerate for 3 weeks. Peeled ginger pieces can be refrigerated in a jar of dry sherry or Madeira for up to 3 months. Use the ginger-flavored wine in stir-fries and sauces. For longer storage, wrap in plastic wrap, seal in a freezer-weight reseal able plastic bag and freeze for up to 6 months. When ready to use, slice off the frozen amount needed and thaw for 5 minutes before using. Cut off the amount of ginger to be used and rinse under water before peeling. Peeled ginger can be chopped, minced, sliced or grated. To easily grate fresh ginger, use the fine holes on a box grater, a rasp grater or porcelain ginger grater. Small chunks may also be crushed in a garlic press. Fresh ginger contains an enzyme which readily breaks down protein. As a result, any gelatin dish that contains even a small amount of fresh ginger will not set. Heat destroys this enzyme so blanch the fresh ginger first or substitute crystallized ginger. The flavor of fresh ginger varies in strength depending on when it’s added to a dish. For maximum flavor, add it near the end of cooking; for subtle flavor add it at the beginning. Ginger adds spice to your food without additional fat or calories. Stir minced ginger into KRAFT Barbecue Sauce for an extra burst of flavor when using to brush onto grilled meats and poultry. Enhance the flavor of stir-fries by cooking minced ginger with the garlic in your favorite recipes. Add minced ginger to marinades, soups and dipping sauces. Its flavor complements meat, poultry, seafood, vegetables and tofu. Infuse milk and cream with slices of peeled, blanched ginger to add exotic flavor to chocolate truffles, custard and homemade ice cream. Add grated ginger to your favorite KRAFT Dressing or creamy dip for instant Asian flavor. Bananas, apples, maple syrup and tomatoes all pair well with the flavor of ginger. Stir a bit of grated ginger into gingerbread, muffin or pancake batters for a hit of zesty flavor. Jazz up side dishes such as rice and fruit or vegetable salads with minced or grated ginger.